Another new month is here! This is when I really start enjoying the cooler weather, gingerbread, apple cider, football, scarfs, the leaves turning… It’s the month when one tends to focus more on gratitude. It’s one shared with friends and family around the Thanksgiving table. Remembering these joys come from God. 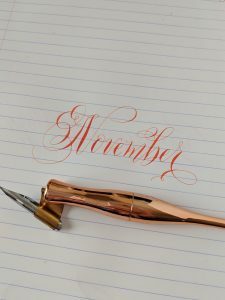 May your November be a blessed one! This entry was posted in Calligraphy. Bookmark the permalink.